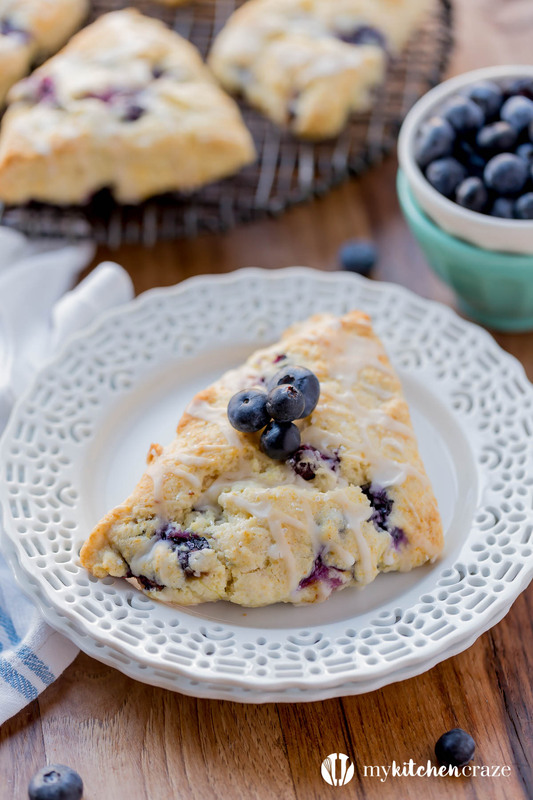 Blueberry Scones with Vanilla Glaze are perfect for a quick grab and go breakfast. They’re crunchy around the edges but moist in the center. Topped with a vanilla glaze to give them a bit of sweetness. I’m on a scone kick lately guys. What can I say, I really love scones. I love how they’re not too soft, but not too dry either. They have the perfect amount of sweetness and are delicious with my coffee. I’ve made these Cinnamon Chocolate Chip Scones before, but this was my first time making scones with fresh fruit. Blueberries are a great fruit, don’t you think? They’re one of my many favorite fruits, besides clementines, bananas and watermelon. I love how sweet and tarty they are. They aren’t overly mushy either. I really hate mushy fruit. And blueberries stay fresh forever. 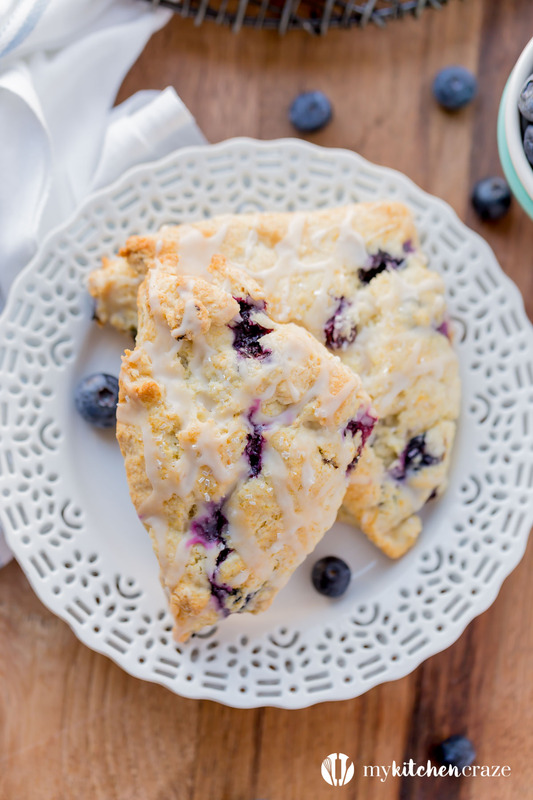 These scones are easy to whip together and are really really yummy! 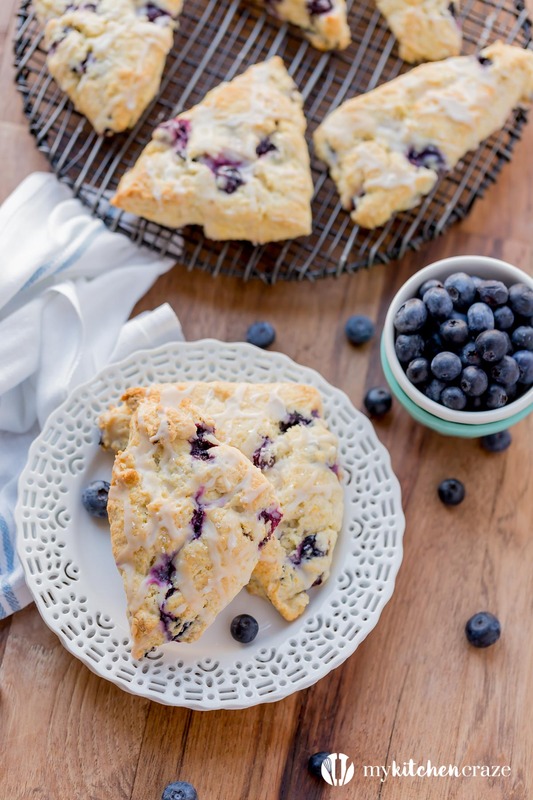 This recipe makes 8 scones and they’re always gone within 2 days at my house. We devoured them to say the least. 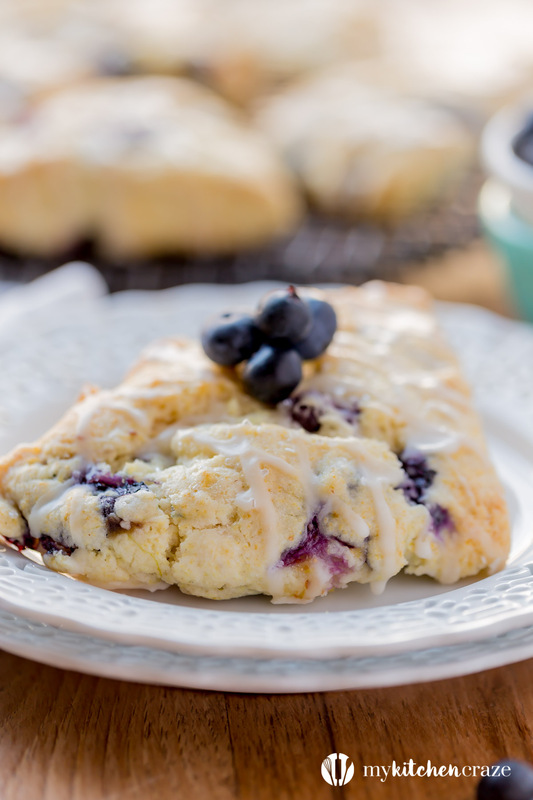 So if you’re looking for a sweet breakfast but gotta go, make these Blueberry Scones with Vanilla Glaze! Make sure you fold in the blueberries, not stir. You don’t want mushy blueberries. The glaze is optional. They’ll taste delicious without it. You can use milk, half & half instead of heavy cream. Make sure you cook them to a light golden brown. You want scones, not cake. Also make sure you eat them within 3 days. They tend to get hard or soggy after that. Last tip…enjoy and have fun making them! In a large bowl, add the flour, baking powder, salt and sugar. Whisk together to combine. Add cubes of cold butter to flour mixture. Using a pastry blender, fork or your hands break down butter until it resembles coarse crumbs. Fold the blueberries into the flour mixture. Make sure to be gentle and not break the blueberries. Fold in the 1 cup of heavy cream, until just incorporated. Do not over work the dough. Press the dough into a 12 by 3 rectangle on a lightly floured work surface. Cut the rectangle in half, then cut the pieces in 1/2 again. This should give you 4 squares. Cut the squares in 1/2 diagonal. This will give you the classic scone shape. 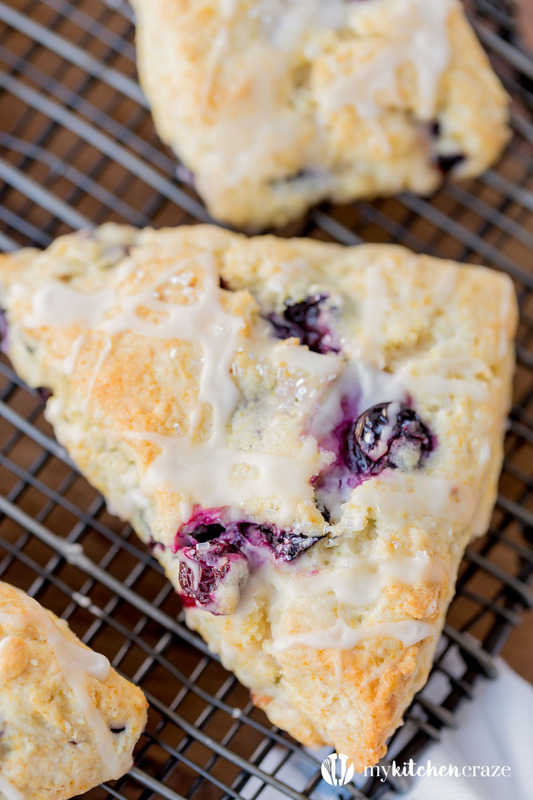 Place scones on an ungreased baking sheet. Brush the tops with the tablespoon of heavy cream. You can also sprinkle some coarse sugar if you have it. Bake 15-20 minutes, or until lightly browned. Remove scones to a wire rack and let cool completely before glazing. In a large glass measuring bowl or small bowl, mix all glaze ingredients until smooth. Using a spoon drizzle over cooled scones. Let sit for 30 minutes, so the glaze can harden.